There's much talk about around the water cooler (i.e. websites, blogs, Twitter, Facebook, message boards) these days about what the Pens organization should do with their UFA's. People are undecided on which players they'd like to see return and which ones Shero should pay no mind. Pensburgh is doing a great job at comparing the players listed below and getting their readers opinions on who they'd rather have back. Another Penguins blog has surfaced and has offered their thoughts on free agency as well. We can expect much more chatter between now and July 1st. In the meantime, here are my thoughts. This post isn't necessarily going to speak to all of the off season moves Shero should do such as trades and whatnot, rather just how each individual has impacted the team and my opinion on whether they should return or not. What can we say about Billy G that hasn’t already been said? 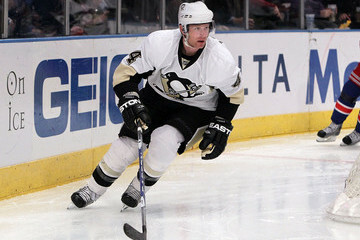 He has played such an integral part since coming to the Penguins organization just before the trade deadline last year. His leadership on and off the ice is something that the every Penguin player and staff member has relished. But alas, the time has come for the one they call “Dad” to make a decision at the ripe old age of 39 as to whether he will return to the ice for one more season. He did so last year, will he do the same this year? Even if Guerin does decide to comeback, fans are divided on whether they’d welcome number 13 back in a Penguin uniform. Despite notching up 21 goals and 24 assists, there are concerns about the aging right winger. The chief concern on the minds of every Penguin faux GM right now is his age. Money aside for now, there is a growing apprehension about his ability to skate on the top line with Sid for another year. Let’s be honest, Guerin certainly showed signs of slowing down this season than from last. What will become of him next year? And if Tangradi makes the jump to the NHL next season permanently and plays well, Guerin will more than likely have to drop a line or two to keep his roster spot. We’ve seen him play well with both Malkin and Staal, but after that the lower lines tend to bring energy to the rink, something Billy doesn’t have as much at his disposal anymore. Another thing to consider here is money. I think it’s safe to say that if Guerin is looking to have the same $2MM price tag, Shero will not oblige. But if he’s willing to take between the $1-1.2 range, that might actually work. See, Shero is taking a long hard look at the youth around the league and within his own farm team. Signing Guerin can potentially slow the development of the other guys while at the same time eliminating his ability to sign, say, another budding young winger. But the upside is the locker room presence and another veteran voice on the ice. Offer Guerin a 1 year $1MM extension. No more than $1.2MM. Feds is an interesting animal. He tends not to play well during the season and only offers his assistance in the playoffs. Though this year he was about as noticeable as Crosby’s beard, throughout. Putting up only 11 goals with a -17 +/- rating and getting scratched 7 of the 13 post season games, its likely Ruslan has seen his last days in a Penguin uniform. When you’ve been slated to take the ice with one of the greatest players in the game (Malkin) and you can’t perform, that just about does it. As of now there’s just no place on the 3rd or 4th lines, so it’s about time to part ways. By far the most important UFA the Penguins have this season. Matt had an incredible two years with Pittsburgh and his stock went way up after putting up a career tying 15 goals on top of showing why he’s the best agitator in the game today. No doubt the controversy over the Savard hit left a bad taste in everyone’s mouth, so much so that it spawned a new NHL rule on headshots; all this in spite of the fact that the hit was not only clean, but legal. It’s not his fault Savard had 7 concussions prior which inflated the severity of the hit…but I digress. As I said, Cooke’s agitator role is the best in the game. This means that even those who criticized #24 will want him on their team. As fellow PensU writer Todd Wyant says, the hypocrites will surface. This means that Matt is certainly get multiple offers for his services. Because of that there is no question that we’ll likely have to wait until July 1st to see what happens. He’s been a $1-1.5MM guy in his days in the NHL. Chances are he’ll get offers as high as $2.5MM from the right team (ala Scuderi). The tension is this: What will Shero be willing to offer him and how much is Matt willing to stay for? It’s no secret that Cooke likes it very much in Pittsburgh. He gets along well with the other players and has a great locker room presence. We all know about his on-ice chemistry with Staal and Kennedy. So much so that it’s garnished acclamation as the best third line in the NHL. In my opinion Cooke should be the primary focus for Shero. He was high on him when the Pens lost Jaarko Ruutu to Ottawa, and since Matt has lived up to hype I’m guessing he’s high on him now. He’s now a gritty Stanley Cup veteran with some great years ahead of him. Something tells me Shero isn’t overly concerned with the salary cap when it comes to Matt. Though its still business and you don’t want to over pay a player. Offer Cooke a 3 year extension worth 5.3$MM. No more than $1.9MM a season. Poni was unfortunately a failed experiment for Shero. Though giving an up-and-coming young star like Luca Caputi was worth the risk in my opinion; there’s no way to know if Caputi’s cut out for the NHL. Now, Alexei played well in his years in Toronto and was a perennial 20 goal scorer. It was thought that he would mesh well with Malkin and flourish. Sadly that was not the case. While only putting 2 goals in 16 games and only 1 goal in 13 playoff games, it's just obvious he's not working out. He was a healthy scratch in game 6 against the Habs and didn’t play well when he had the opportunity in game 7. Though in his defense, no one really played well. All this attached with rumor that he didn’t show up for his exit interview with team management pretty much says there is a mutual agreement that he’ll find a new place to call home. Aside from Cooke, Gonchar is the biggest UFA story for the Penguins. There’s been talk all year about whether the Pens powerplay expert would extend his contract and stay Crosby and company. There was talk between both sides mid-season, though nothing could be agreed on. Sarge (as we call him) has been nothing short of excellent for the Penguins in his 5 year tenure. He’s perhaps the most important part of the Penguin powerplay and simply put, he’s the Pens Secretary of Defense. While mostly known for his offensive prowess, Gonchar has done his share of defensive duties as well. Unfortunately what fans are going to remember of him was his weak, someone disinterested defense in game 7 against Montreal. But overall Gonch has played his role well. The biggest concern here is cap space. 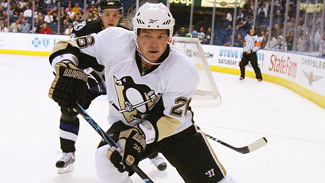 Gonchar currently make $5MM a season and sources say he’s looking to retain that price tag. As of now he’s the highest paid defenseman as he should be. But being 36 you have to wonder how many good years #55 has left. Some have argued that Shero should let Gonch walk since Gologoski (or Legang) can likely fill the offensive gap and that he should go after someone like Volchenkov for the defensive aspect. While there’s no question that the Pens need a shut down defender, I still think you have to try and work something out. Personally though I think Gonch will get better offers elsewhere and likely take it. UPDATED: Offer Gonchar a 2 year extension worth $7.5MM. No more than $4MM a season. If Gonch resigns you might see Kunitz dealt for cap space. Reason for the update is because I forgot about the CBA for a players over 35. This rule states that if a player signs a multi-year deal when the player is 35 or older, starting in the second year of the contract, that amount will count towards the team's salary cap regardless of whether the player is on the active roster or not. This is designed to keep teams from signing older players to lucrative front-loaded contracts, thus saving cap room, in which there is no expectation the player will actually play in the latter years. It has been said elsewhere that Eaton is good at everything and great at nothing. I agree with this observation. And I agree with it because while he’s not great, he’s absolutely consistent. He’s a quality defender and will once in a while even get you a goal now and then. Unfortunately he’s not the shut down defender the Penguins need to depend on. Sure he’s reliable enough not to make a bad play and dependable enough to give you the same thing night in and night out. But he’s not a guy the opposing offense has any fear of. Offer Eaton a 2 year extension worth $3.8MM. No more than $2MM a season. The Penguins were kind of spoiled this year with “The Key.” See, Jay received a buy out from the Blues for approximately $3.5MM and signed with the Pens for $800k; way below his market value. He was the leading shot blocker on the flightless bird’s roster this season, as we all expected. Slow on the ice for sure, but he would do just about anything to prevent the puck from going in the net. He’s had his share of injuries which makes everyone worry about his quality of play in the future, but I think McKee was a welcomed addition. Problem is, I don’t think the Penguins have a place for him. Sitting on the sidelines much of the time during the playoffs doesn’t really say that you’re wanted. I’m guessing Shero won’t offer him a contract given the predominance of players NHL ready in Wilkes/Barre. Leopold has certainly done a good job since being acquired from the Panthers before the trade deadline. He’s a little different in style from Eaton in that he’s not afraid to carry the puck through the neutral zone, but otherwise they’re similar in what they bring to the ice. In my opinion the second Jordan did his job and did it well for what his salary was at ($1.7MM). In short, he’s a player that’s worth his salt. 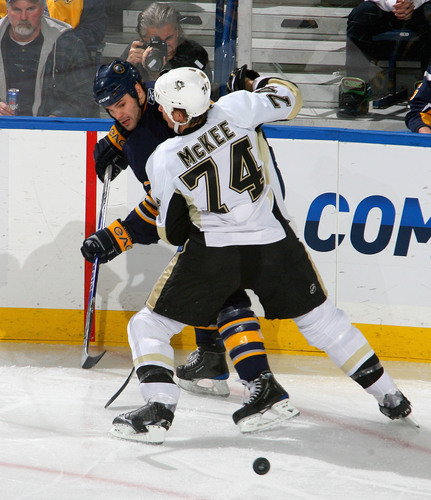 I’m a little undecided on whether I think Shero will offer him a contract for reasons similar to Jay McKee. Couple that with the fact that Dyrek Engelland was just signed in at $500k and should get the call up this year. It might depend on whether Eaton resigns, but that’s the chance you take. Jordan might also have better luck testing the FA market. Offer Leopold a 2 year extension worth $3.8MM. No more than $2MM a season.